The process of fundraising has changed dramatically over the last decade, and it is now more important than ever to harness the power of the Internet to reach out to potential supporters around the world. 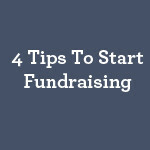 However, it can be difficult for novice fundraisers to understand the best techniques to help them quickly launch an effective campaign. With this in mind, DonationTo has compiled four easy to use tips that will make it much easier for you to reach your goal.